Let us guide you in your passion for the visual arts. Learn how to be an artist while learning the business. Or prepare to mold young minds at the primary and secondary levels. Take on a studio practice. Take advantage of the opportunity to learn from our experienced faculty. Our teaching professionals will lead you to excel in your specialization. So soak in the Nashville art community and its opportunities. Work in Open, our student-operated gallery. Chances for experiential learning (and networking) abound. We'll connect you to top internships in museums, galleries and studios here. Whether your next step is graduate school, teaching, or working in the arts, you can rest assured that you will be well-prepared. 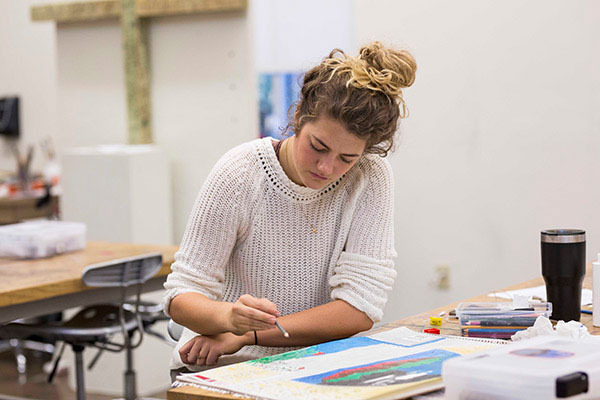 Visual art students receive a strong foundation in studio art, color theory, conceptualization and presentation and art history, along with encouragement to create in studio practice. Our visual art administration students will add business, management and entrepreneurial knowledge to their skill set, along with what they achieve within nine hours of visual art electives. Upon graduation, our visual art administration students will be ready to begin their careers in the art business. Our visual arts teaching students will combine their artistic foundation with training in core and specialized professional education. When they receive their degrees, they will be well-equipped to teach art at primary and secondary levels. Student teaching required for visual arts teaching. Visual arts teaching majors have a built-in minor in education and are not required to take another minor. Visual arts administration majors have a built-in minor in business and are not required to take another minor. Christian art program in the U.S.